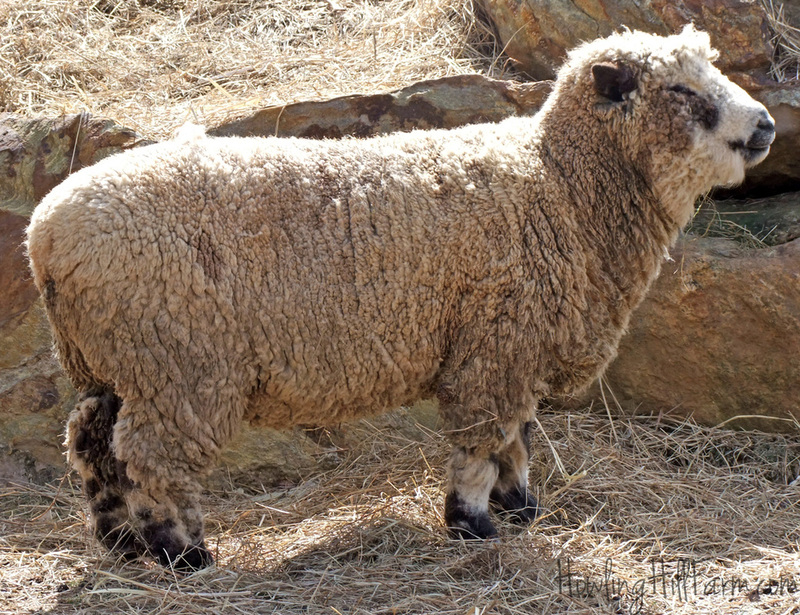 Cheever is a registered Babydoll Southdown ram. 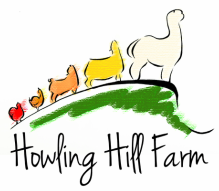 He is extremely thickset and masculine, but his disposition is incredibly calm and friendly with both humans and other sheep. Cheever's sire was even more dramatically spotted than he is. His wool is extremely fine, and he has excellent density. 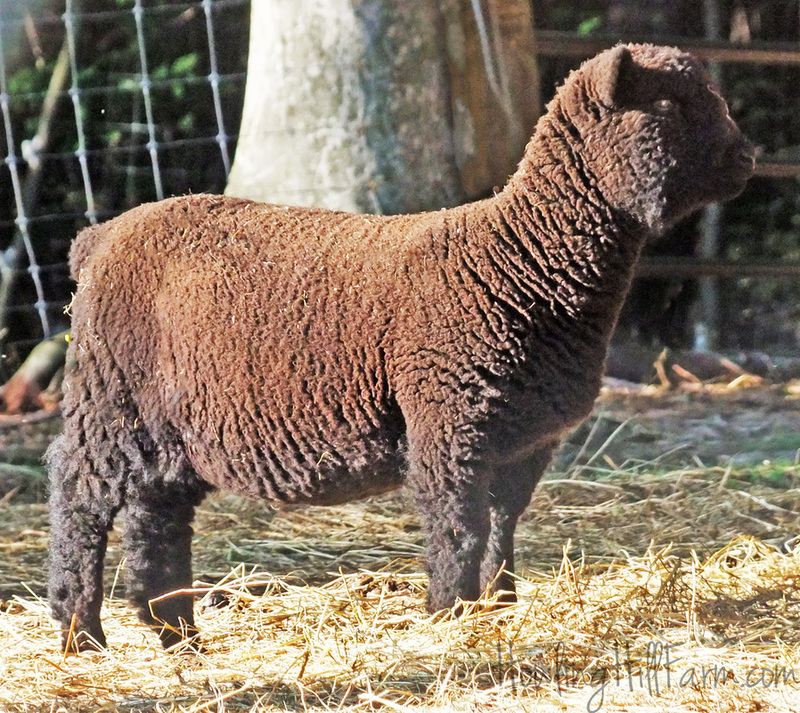 Ike is a gorgeous registered Babydoll Southdown ram. He has perfect breed type with a wide head and perfect Babydoll smile, and full wool coverage on his legs. He is wide and compact. Ike's disposition is incredibly calm and laid-back. His spots are dramatic and beautiful. 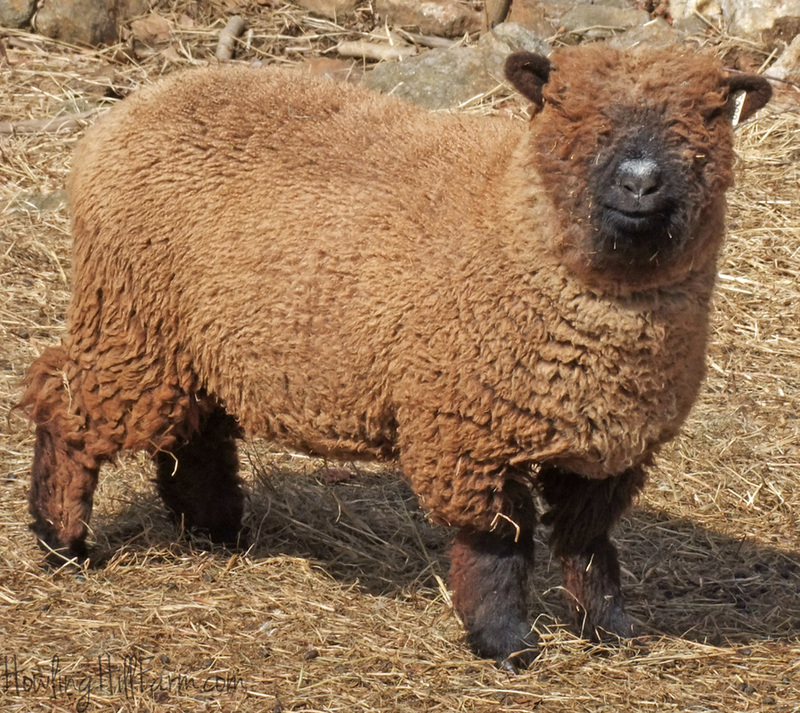 Noah is a loud-colored Harlequin ram lamb. He is foundation pure, with many generations of Harlequin breeding behind him. 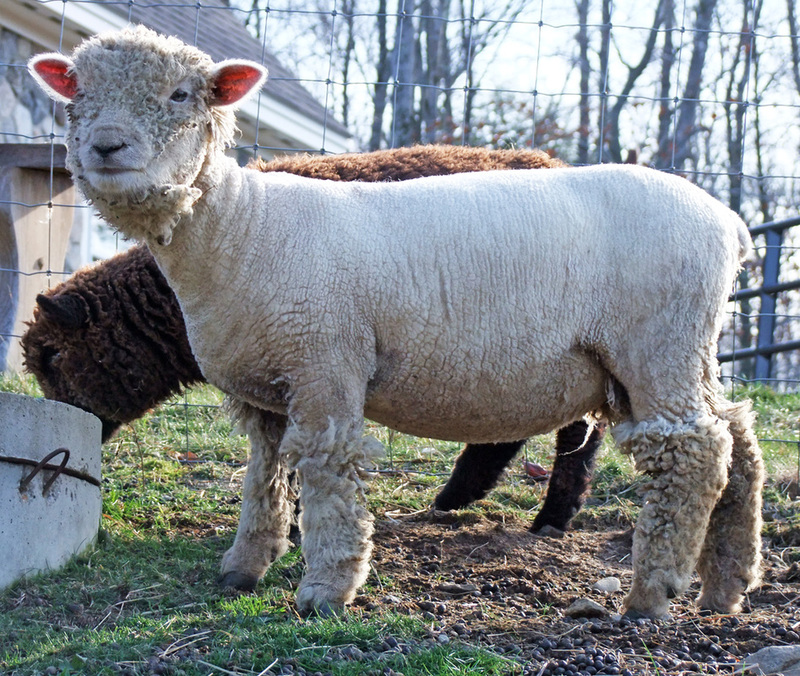 True to the breed, Noah is compact and incredibly friendly, with a beautiful head that is reminiscent of a Babydoll Southdown. He has beautiful, fine wool with a high-frequency crimp, good staple length and marvelous hand. Arlene is a super short Babydoll ewe. She has a short-stapled yet fine wool. Her blanket is black, but she has very intriguing white splotches on her flanks. Arlene is pretty laid-back, and is neither particularly outgoing nor overly shy. 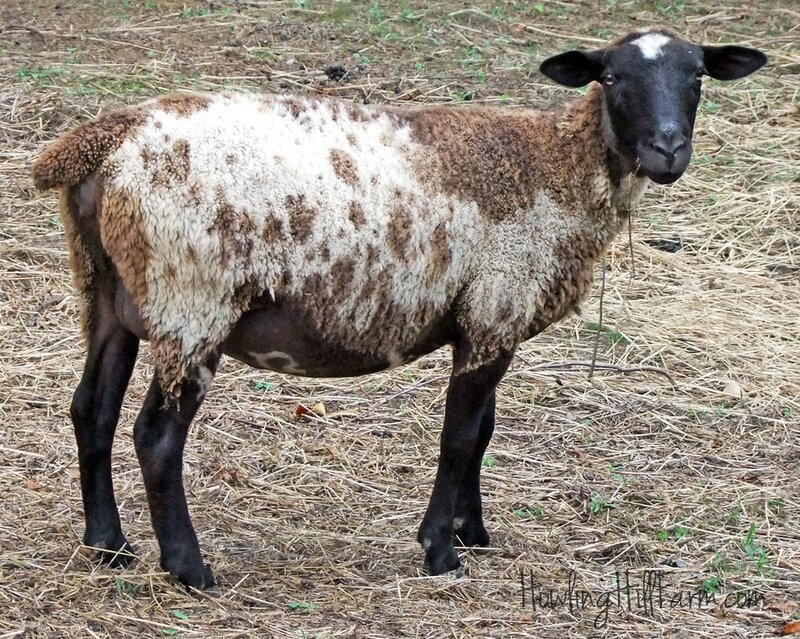 Babette is a gorgeous example of a Harlequin ewe, with a beautiful head, short stature, and great conformation. Although her wool is not as exquisite as Lily's, she is nevertheless a very nice sheep. Best of all, she produced a stunning black-and-white spotted Babydoll/Harlequin ram lamb in 2017, so she has proven herself as an amazing dam and producer. 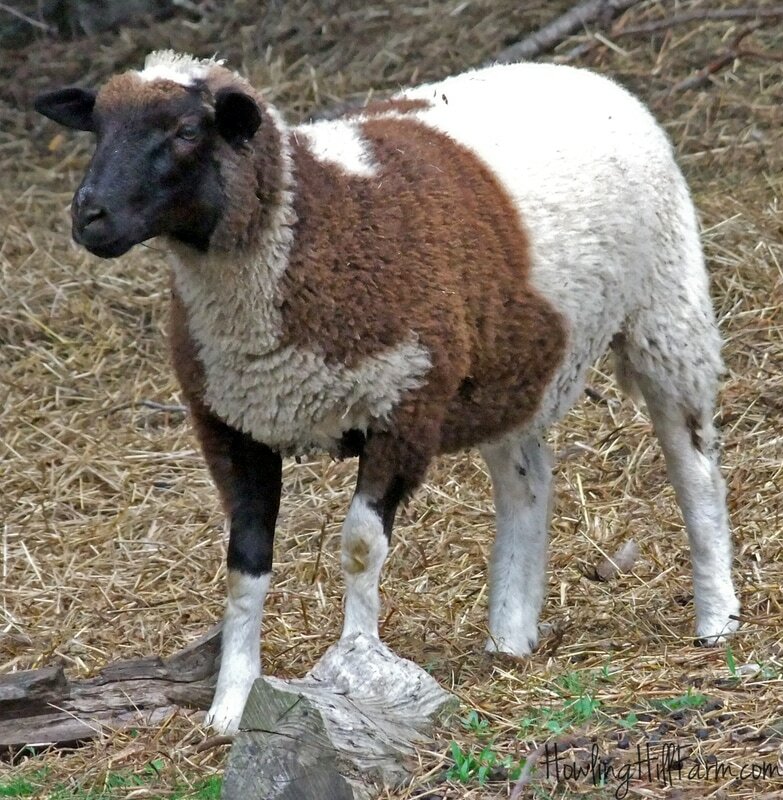 Yes, Barbara is a "mystery sheep," but her coloring was so very unique -- and her wool so very nice! -- that I just had to add her to our foundation spotted sheep flock. Although she does not have the heavyset, stocky breed type or wide, sweet head that we are breeding for, she is a nice, miniature size, she is polled, and she has great conformation, so she is a nice start. Her 2016 daughter, Cookies, demonstrated her ability to produce spots (albeit not the same style of spots as her own). Although her 2017 son by Ike did not inherit either of their spots (he is white), he is dramatically improved over Barbara in terms of bone and breed type, so we are eager to try her with another colored Babydoll ram. 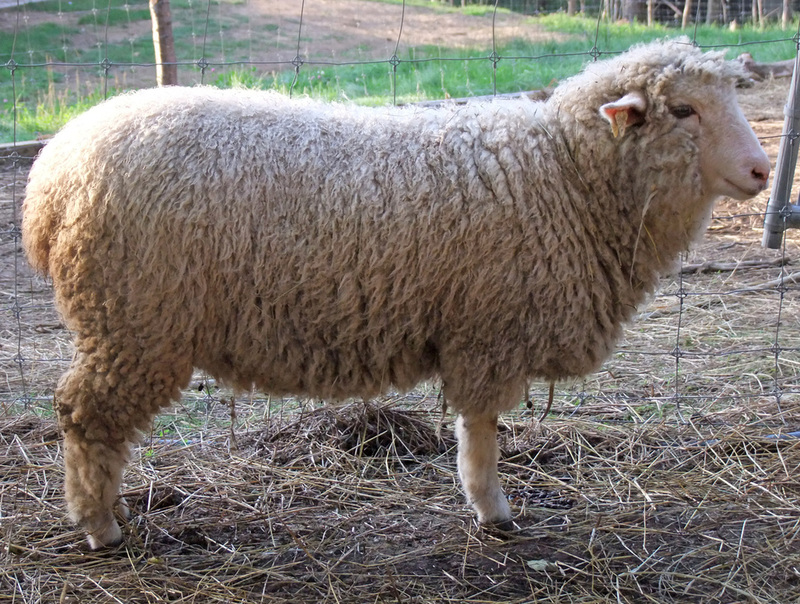 Butter is a very heavyset ewe with a wide head and classic Babydoll smile. She is short-coupled and solid. Butter is a bit shy, yet very easygoing. She is a proven mom. Cookies is the daughter of Barbara and a very handsome black ram with beautiful wool. Like her dam, she has excellent conformation and a beautiful fleece, and she is very well conformed. 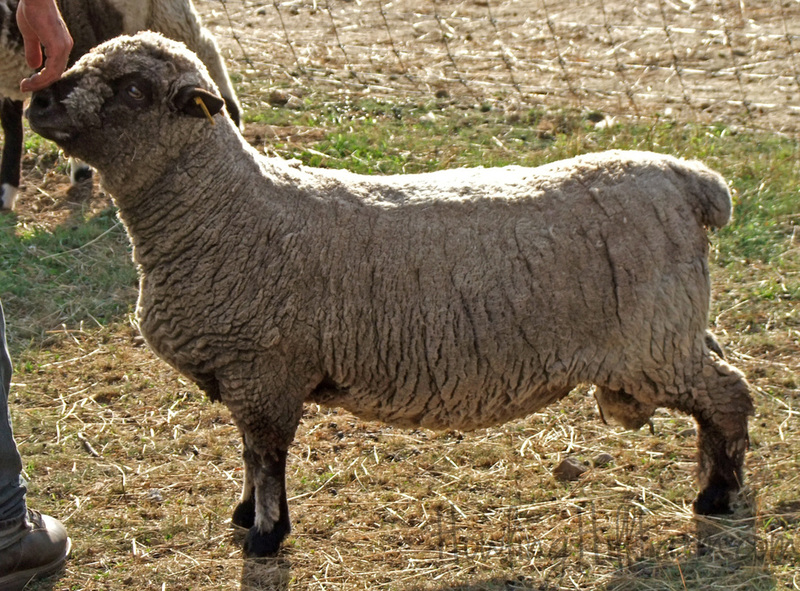 She has slightly heavier bone than her dam, though she is still lanky for our program, but she has a lot to offer, so we are eager to see what she can do paired with a typey ram. 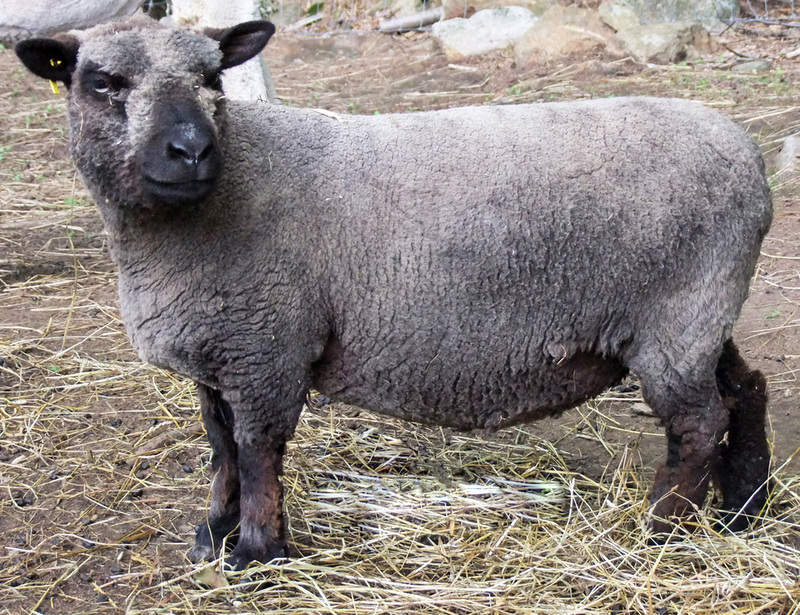 Jiggles is, as her name implies, a stout Babydoll Southdown ewe. She is a proven mother of twins. Jiggles has fantastic type and conformation, and she loves people. Her wool is short-stapled but extremely dense, and of good fineness. Licorice has the most beautiful, extreme head I have yet seen on a Babydoll. She looks just like an ewok. She has stout, heavyset legs and a friendly disposition. Her wool has good staple for her breed. 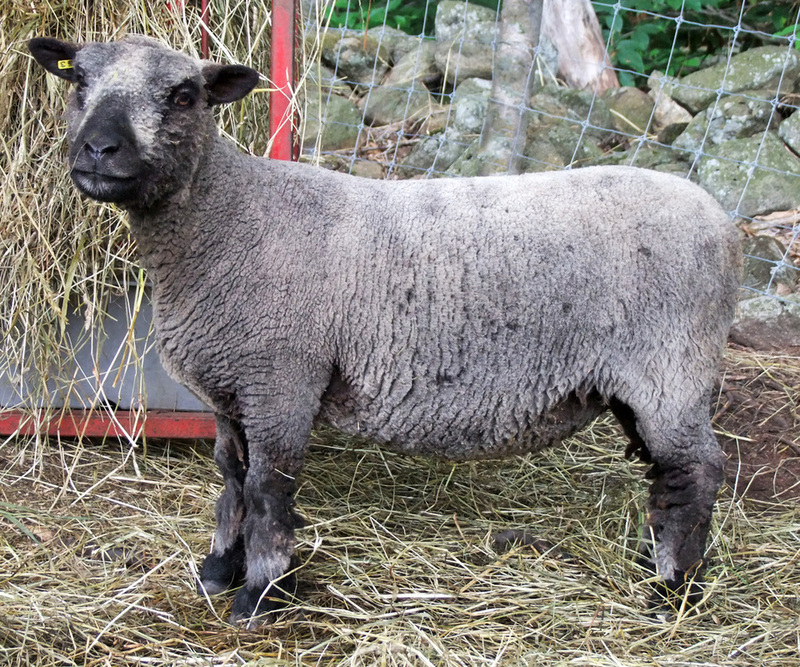 Lily is a compact (<24"), sweet-faced ewe with good conformation and structure. Her big deal, though, is her fleece. Lily's fleece is fine, with an incredibly high-frequency crimp that is organized into discrete bundles. She is shy initially but loves people once she gets to know you. Poppy is a black Babydoll ewe lamb, and one of the cutest you ever will see. She is incredibly stout, with terrific breed type and great conformation. Her wool is short stapled but fine. She is energetic and playful, if a bit shy with people. Puddin is moderately slighter in build than Jiggles; she is also a little bit shier, though she is friendly once she warms up to you. However, her conformation is excellent and she is still extremely stout. She, too, is a proven mother of twins, and is also possessed of a dense, short-stapled wool. Salt is an absolutely adorable Babydoll ewe. She has a lovely fleece with a very long staple for a Babydoll, and the cutest face and leg coverage. She is also the friendliest sheep you will ever meet. She loves people and attention.